Aged White Strat Pickguard Set w/ Aged White Pickup Covers Knobs Tip. Strat Pickguard x 1. Color: Aged White Pickguard Set with Aged White Parts. Strat Back Plate x 1. Strat Swtich Tip x 1. Single Coil Pickup Covers x 3. JOYO Pedal. Tuning Pegs/Machine Heads. Tuning machines ,Pegs. Model: EQ - MP3. Microphone Accessories. Double Bass Bow Frog. Violin Bow Frog. Viola Bow Frog. Pickguard: SSS (single/single/ single coil) style. 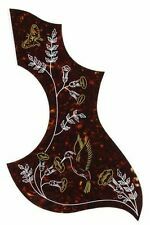 1 x Guitar SSS Pickguard. Aluminum Material Guitar Pickguard. 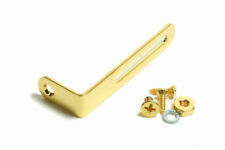 Aluminum material pickguard with anodized gold color. With 11 screw mounting holes in the side of pickguard. Package Include:1 x Loaded Pickguard SSH. This is the loaded,prewired pickguard from a electric guitar.Set up with the single single humbucker pickups.The pots and toggle are still installed,mounting screws included. With adhesive tape on the back and uncover it to stick on the guitar. 1 x Guard Plate(guitar not included). Anti-scratch to protect the guitar. Pretty cool for your guitar. Red shading and have white flower, bird, butterfly design on the shell. 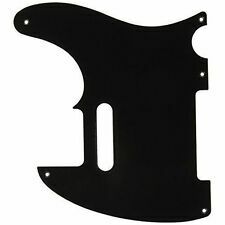 NEW - Genuine Fender Standard Stratocaster Pickguard. 11-Hole mount modern-style pickguards. Shielded with second screw near middle pickup. Other alphabets (Cyrillic, Japanese, Chinese, etc.) will not be translated and your item will be delayed. Quality is great! Price is Cheap! 13 Pickguard Screws are included. P Bass Pickguard Silver Mirror 1 Ply. Precision Bass Pickguard x 1. Color: Silver Mirror 1 Ply. We promise we will find a more better solution. Stratocaster aluminium full size shielding plate - fits under pickguard. Universal fit - fits 8/11 hole US/MiM spec Fender Stratocaster. 0.3mm thickness aluminium sheet. · develop and improve our products. Quality Pickguard Blank Sheet Material forGuitar Bass Pickguards Custom DIY Building. Item: One Guitar Bass Pickguard Sheet. 1 xGuitar Bass Pickguard Blank Sheet. Color: Blue Color. Missing Order: These 3 situation may occur that: 1. 100% Brand new,never used Item's color might be different from the picture because of the aberration. This loaded pickguard is COMPLETE! 3-ply black/white/black 11 mounting holes guard loaded with 2 humbuckers 2 humbuckers,brass backed(approx 8.5K/12K resistance) wiring harness(CF potentiometers-1 volume,1 tones-capacitor,3-way switch)knobs I cannot guarantee that the screwholes will line up with those on your guitar given the great variety of models on the market. Package Include: 1 x Loaded Pickguard HH Brand Unbranded MPN N01832 UPC 700443081511 EAN 0700443081511 Feature 3-way switch Resistance 8.5K/12K upsku10100566. 1PCS White Pearl Pickguard Blank Sheet Celluloid Material for Acoustic Guitar. Ideal for pickguard custom; Enough material for 2pcs comma acoustic guitar pickguards. 1pcs Pickguard blank sheet. Material: Celluloid material, middle soft style. 1 X Prewired Pickguard 1 X Schrauben Set. This item is made of alnico V and copper. This product had been through strictly inspection with pretty good testing results. - Material: Alnico V, copper. Strat HSS Pickguard Set Silver Mirror. 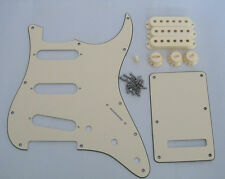 Strat HSS Pickguard Set x 1. Item is covered with plastic films! Pickguard Screws x 20. Color: Silver Mirror. Material: Made of 3ply PVC material. Pickguard: SSH (single/single/humbucker ); with 11 screw holes in the side of pickguard. 1 x guitarHSS pickguard. Missing Order: These 3 situation may occur that: 1. LP Pickguard 3 Ply Black with Gold Bracket. Excellent Quality and Finish (The pickguard is covered with plastic film which could be peeled off). The Pickup depth cut into pickguard: about 17.8mm. Black 3 Ply Pickguard with Gold Bracket X 1. Ukulele & Uke Accessories. Banjo Accessories. Guitar Wiring Harness Kit 5 Way Switch 500k Pots for Fender Stratocaster Strat. Belcat Hot Rail Blade Humbucker Pickup for Fender Strat Electric Guitar 2 Pcs.